Oceans are a great source of inspiration, food and even renewable energy. However, we treat them like an enormous dumping ground and forget that we are submitting our seas to some serious stress. 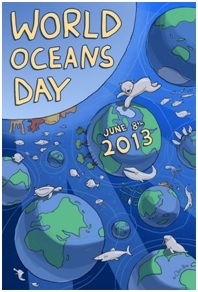 World Oceans Day on 8 June 2013 reminds us that our seas can be more fragile that we often think. Here are the five of biggest problems facing our seas right now. Solid waste (plastic bags, balloons, glass bottles, shoes, packaging material etc) keeps finding its way to the ocean. The microplastic accumulation in the Great Pacific Garbage Patch alone has increased 100-fold in the last 40 years. Some of the most serious impacts of microplastic accumulation include the transport of pollutants and the introduction of alien species, as well as the risk of ingestion by seabirds, mammals, fish and invertebrates. And if fish eat contaminated plastic, these substances might as well end up on your plate. Increased carbon dioxide (CO2) emissions from burning fossil fuels have serious consequences. Together ocean acidification global warming can badly damage fragile ecosystems such as coral reefs and affect species distributions, increase development and larval anomalies, impair normal functions and have major bottleneck effects on population growth. Last month, CO2 levels in the atmosphere topped 400 ppm for the first time in human history. Without urgent measures to drastically reduce CO2 emissions, our oceans are at imminent risk. Overfishing is not only depleting commercial fish stocks, but also affecting other species directly depending on them. Overfishing can cause marine animals to starve. Severe shifts in species and population composition results in dramatic ecosystem change and massive commercial loss. The major source of this pollutant that usually ends up in our plates is coal plants. This pollution is then transported in the oceans’ currents and streams, taken up by bacteria and seaweed. This contamination is amplified along the food chain, especially in large predators like tuna. Mercury is a toxic metal that can pose great risk to pregnant women and young children. Noise produced by humans by ships, seismic surveys, sonar and other sources is disrupting marine life that depends on sound, from giant squid to crab, as well as whales and dolphins. Many organisms depend on sound for communicating, mating and finding food. Background noise levels have doubled every decade for the past six decades. As a consequence, the communication range of blue whales has decreased from more than 1,000 km to only 100 km in the Northern Hemisphere. Underwater noise pollution is often forgotten, but it poses serious threats to cetaceans and fish stocks. It's time to act now: waste less, eat fish from sustainable sources and reduce your CO2 emissions. Our actions have key impacts on the ocean life.